Main Setlist: The Way It Goes, The Wanderer, Mystery Medley, Twenty Wild Horses, Under the Influence, Whatever you Want, Caroline, Don't waste My Time, Rockin'all over the World, Anniversary Waltz. Tour Note: A Pub/Club tour in the UK, Holland & Germany to promote the new album "UNDER THE INFLUENCE". 29.3.1999 - the "Under The Influence Pub Tour" dates were announced in The Sun newspaper on Friday March 12th. Their competition received some 10,523 entries, so these entries were split into regions of the UK in order that as many areas would be covered as possible, and pubs on the shortlist were considered according to their suitability for the gigs. 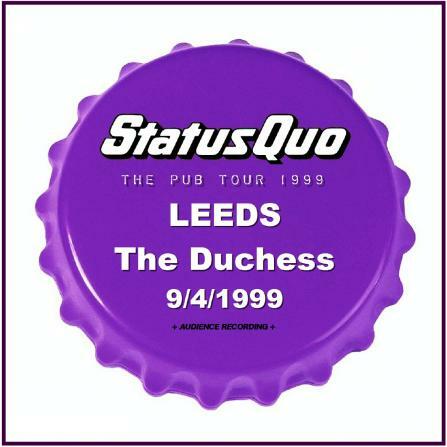 Quo are due to play a 60 minute set commencing at 8:00pm at each of the lucky pubs.The first of Quo's ten pub gigs turned into more of a daylong event than a gig, both for the band and the lucky few at the pub. Early arrival at this large East End pub was rewarded by some unusual access to Quo promotion. 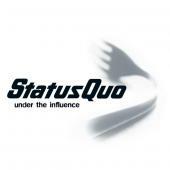 First off, Quo arrived at about 3pm - in ubiquitous stretch white limo, make no mistake, the rock stars had arrived in East Ham! 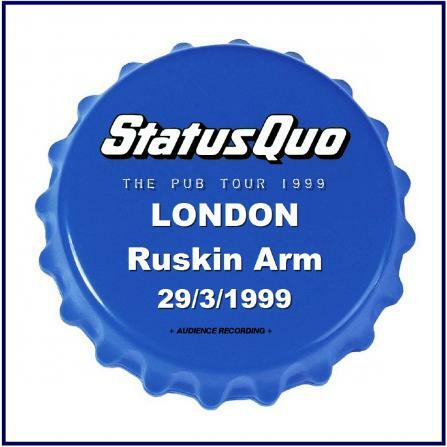 They were greeted by a number of familiar Quo fans, locals and members of the press. The promotion for this first gig was very well organised by David Walker and his team. An extensive photo shoot outside the pub followed, the whole band then just Rick and Francis, before the band headed into the Ruskin's back room (where the gig would later take place) for a series of TV & Radio interviews. 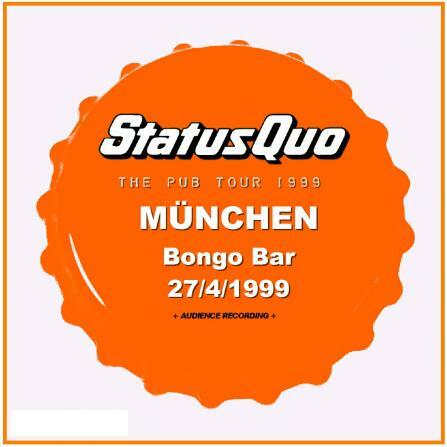 10.4.1999 - in Germany's biggest newspaper "BILD" is a competition called "Gewinnen Sie Status Quo für Ihre Party" ("Win Status Quo for your party"). You have to name Quo's biggest hit. The winner could turn up with 100 friends to one of the 5 german club-shows in Hamburg 25.4 - Berlin 26.4. - Munich 27.4. - Frankfurt 28.4. and Cologne 29.4. (additional show in Leipzig added later) The performance at Frankurts Disco "Nachtleben" is broadcasted live by german radiostation HR3. 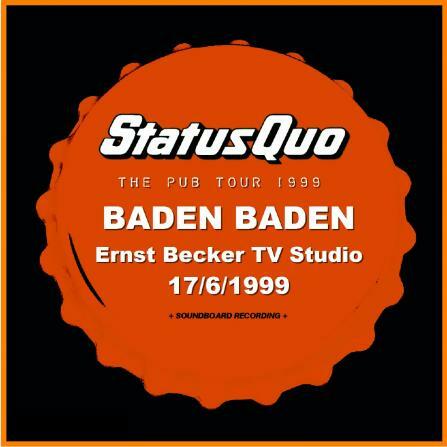 17.06.1999 - Status Quo live in german TV studio of Baden-Baden where they played a stunning 70-minutes performance in front of 300 people. The show "Ohne Filter pur" is a long-standing german concert series and featured a lot of well-known artists and bands. 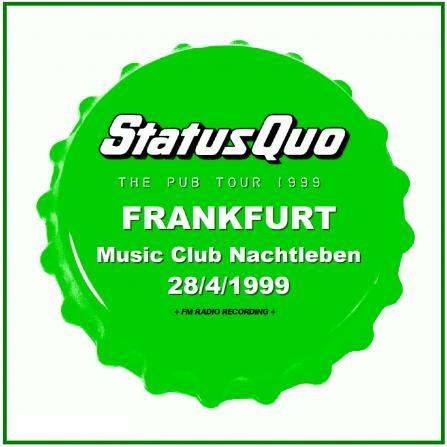 Quo's TV-performance was filmed and later broadcasted in Germany.